The San Pedro Holiday Boat Parade is fast approaching and we need the involvement of all of San Pedro Town to make 2107 the best yet! How so? WE NEED TO SUPPORT OUR BOAT CAPTAINS! The Boat Parade is one of San Pedro’s signature events, not only helping the community get in the festive spirit, but also celebrating the seafaring origins upon which San Pedro has grown from. More than ever, this year's success will depend on the pride, enthusiasm and support of the community; individuals, businesses and visitors alike. To anyone who loves this island, your participation will make strong the large family that celebrate the holidays together as a community, San Pedro as our home, as well as promote it as a wonderfully unique place to live and visit. The 2017 Holiday Boat Parade will be our third year organizing this event, and we have learned that to make it hugely successful, we NEED to come together and support our boat captains; they are the lifeblood of our tourism industry on our island! We need to encourage them to join this San Pedro tradition, and make sure that their festive spirit is appreciated! This is where you, the community, come in...The time involved setting up/decorating boats, as well as loss of income to tour operators, was a large deterrent in the past. We’ve come up with a solution: Increase the cash prizes to the boat captains to help offset both the cost of decorations and loss of income. We have $10,000 in cash prizes this year! Next, we encourage tour operating boat captains to invite guests to purchase a spot on their boat, where boat captains are able choose the price and, if they wish, can either keep 100% of the proceeds to help offset costs, or donate part of the proceeds to Raise Me Up. Lastly, and the biggest assistance, was in partnering boat captains with local business and individual sponsors with either lights, funds or manpower. In return, boats participating in the event receive advertising, as do all sponsors, as a supporter of the community! This year the Parade will take place on Saturday, December 16, 2017, the route begins at Wayo's Beach Bar, heading south with a turnaround at Crazy Canucks Beach Bar. This allows all participating boats to pass the official judging station on the Sandbar dock twice. Boat captains from years past, and those who have ever thought to participate, WE NEED YOU! Business owners and individuals interested in participating via sponsorship of lights, man hours and/or prizes, we encourage you to be involved! This event is not only a celebration for all the families in San Pedro but also a great opportunity to promote what an amazing place we live in. 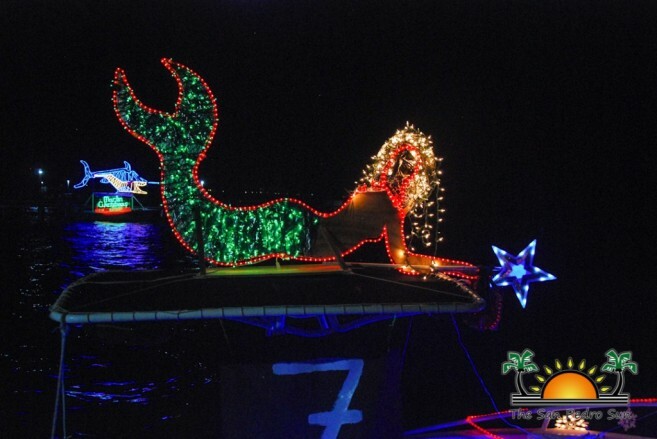 Raise Me Up first became involved with the Lighted Boat Parade in 2015, when the event was on the brink of being cancelled. We were approached by members of the community and asked if we were willing to take on this endeavour. Having no idea what we were doing, we accepted the challenge, along with the blessing by previous organizers and San Pedro Town Council. Amazingly, it was a success with 15 boats participating, funds raised for charities and leading to valuable experience and suggestions from the two years we have been involved. So please, San Pedro community, we ask that you take part in this tradition and help keep it alive! For further information please contact Dee Regis at [email protected], Brittney O'Daniel at 630-1241 or message our Facebook page (https://www.facebook.com/SanPedroBoatParade) and register ASAP!